* The bracing intro kicks off as a citrus mint cocktail with some spice – I get some orange, mint, and cloves. * Initial projection is loud and sweet – people around you will notice this. * While it stays on the sweet side, it starts to mellow when a light leather and a hint of wood starts to mellow it out. Summary: When I went to the Amsterdam Dance Event in 2008, it seemed like every guy at every nightclub was wearing 1 Million. It had just launched in Europe, and clearly the marketing campaign was successful. This is a clubbing fragrance with great projection and longevity – clearly not for the office. Although it’s labelled as an EDT, it is as strong as an EDP. I bought a bottle at the airport on the way home and absolutely loved dousing myself in it. Just as I strive not to put gender restrictions on a fragrance (though they are sometimes obvious), I also try not to put age restrictions on them either. But, smelling and wearing One Million – it is clearly targeted and designed for teens and twentysomethings. Though I still wear it from time-to-time (I am 40), I really don’t think it’s appropriate for those past their mid-30s. It is a scent for a guy who has grown out of Axe or Fierce and is ready for a going out fragrance. 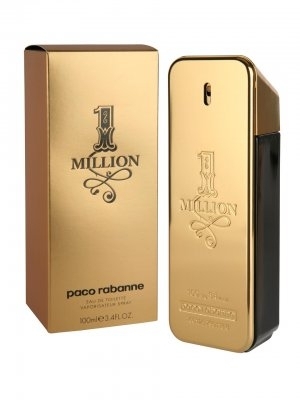 The scent also has strong associations for me – scent memories – of clubbing not only in Amsterdam but in Miami as well..
Paco Rabanne 1 Million is widely available at department stores and Sephora. Disclaimer: No disclaimer needed, bottle purchased by me. Image courtesy of the Scentualist.